Another year has gone by, a lot of amazing things have transpired, and the ArtOfBI.com is still here sharing the good word on Business Intelligence and Enterprise Performance Management. Again, a big thanks goes to all of the readers of The Art of Business Intelligence. This year we promise more great articles, associations, presentation, products, and hopefully a contest or two (yes, with prizes). On a career note this was a big year for me personally. The very brilliant Oracle BI specialist consulting (professional services) organization I’ve worked with for several years, BI Consulting Group (BICG), was acquired by Capgemini. Capgemini is a very large Information Technology services organization based in France with global reach and a software agnostic portfolio of offerings. My wonderful boss, Amy Mayer, did an amazing job building BICG and is still leading the troops behind the Capgemini Oracle Analytics practice. ArtOfBI.com and another team that I have been helping develop some amazing open source tools, Fyght Group, has launched the first plug-in products for Oracle Business Intelligence 11g. Project Amelia and Metadata Search (MDSearch) for Oracle BI 11g are both available for download. Take a look at those when you get a chance. Get ready for Social Collaborative Business Intelligence from BITeamwork. Oracle Open World 2011 was also a grand success this year. I had the esteemed opportunity to speak at the ODTUG user group session as well as at a main session with my colleague from Capgemini, Marty Mersinger, on Oracle BI 11g’s Action Framework. Java, Java, Java – ‘nuf said. 2011 also marked the start of the ArtOfBI.com podcast which has had some amazing guests including authors, bloggers, and market analysis experts. We are adding more interviews to the docket for 2012 for your listening enjoyment and intellectual ferment so keep an eye on our podcast feed. The Oracle ACE program both rejected my application and approved me in 2011. That might just be a first but I’ll have to confirm that with the good folks at the Oracle ACE program. I am super stoked about that acheivement and I hope to contribute a lot in 2012. I think my plan is to have Mark Hurd transition his current role to me in about 6 years. I’ll start working on that next week – I’m not joking. A big thanks to Justin, Lillian, and Brian S for the respect. I just got my pully in the mail last week – it looks brilliant on. Cheers! Visitors and fans of ArtOfBI.com continue to increase. So some people do like what I’m churning out over in this little corner of the web. Monthly visits are now at ~10,000 per month. 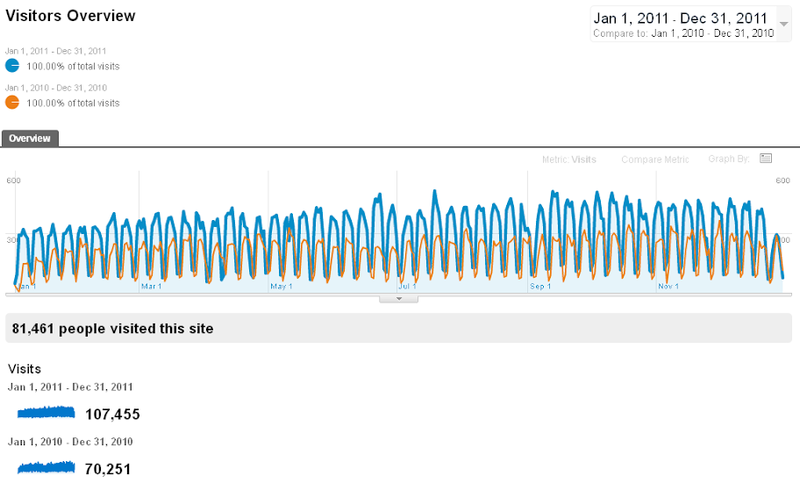 Those are vanity metrics (thanks Eric Ries for the term) I know but artofbi.com is both a passion and an experiment. There is consideration in 2012 to make ArtOfBI.com more of a destination than just a blog. The aim is for more growth and there is a path. I’m just not sure if this site should start walking it. Lastly, I’d like to thank everyone who is passionate about technology. If you understand that technology is a means to an end and not the end itself then you understand that in the end it is people who count the most. At the end of the day, it is people that you work for and people that buy your product. It is people who innovate. It is people who share and people who care. Thanks again for a great 2011.